The Great Falls area is located in the southeastern part of Chester County. 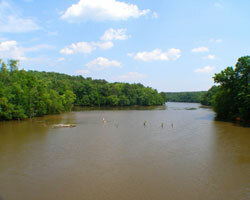 Known as Chester County’s river town Great Falls is situated right on the Catawba River and very close to Lake Wateree. In the past, the town grew and thrived because of Duke Power, a hydroelectric plant, and its location on the Catawba River. Since then, Great Falls continues to grow more and more due to its close proximity to three larger metro areas. The schools in Great Falls are part of the Chester County school system which is known for its excellence in education and continuing commitment to student success. Great Falls is close to Chester, Lancaster, Rock Hill, Columbia, Lowry’s, Fort Lawn, Richburg, Charlotte, and York. The Chester County Hospital and Nursing Center, located in Chester is the closest hospital in the area. The town of Great Falls has lots of opportunity for outdoor fun. Take a trip to the Chester State Park and go hiking or horseback riding on the nature trails. Visit Lake Wateree and rent a boat and have plenty of fun on the water. Take a short trip to visit the areas of Cheraw, Chester and Winnsboro. These three areas are part of a bigger area known in South Carolina as the Olde English District. The district encompasses the land that was settled in the 1700s between Charlotte and Columbia. The towns and areas located throughout the district have many historic sites and homes dating back to before the American Revolution. Riding through the highways of the district, you’ll never run out of beautiful places to see and learn more about.